It's really like a computer network topology. 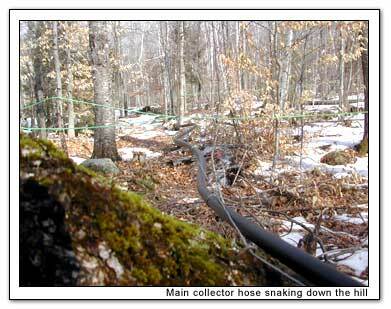 Sap starts at smaller nodes, feeds into central hubs, eventually running down the Maple Syrup equivalent of a T1 high speed line. The main hose is about the thickness of a thumb and has one or more support wires to keep it from sagging towards the ground. Our neighbor's operation covers a few acres or more, 500 trees in all. 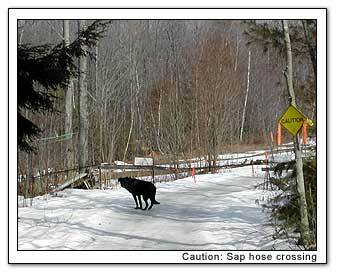 The main hose slowly snakes it's way downhil, crosses the trail, and winds up in their syrup boiling building.